Black Cohosh is a popular remedy for hot flashes, mood swings, and vaginal dryness from menopause. The herb does not stimulate the production of estrogen, but it may compensate for low or highly variable levels of estrogen during menstruation or in the menopause. North American Indians used this medicinal plant for gynecological disorders, kidney disorders, malaria, malaise, rheumatism, and sore throat. Additionally, it was used for backache, colds, constipation cough, hives, and to induce lactation. Black cohosh served as a home remedy in the 19th century for fever and rheumatism, as a diuretic, and to induce menstruation. Its popularity was strong among a group of alternative practitioners who referred to black cohosh as macrotys and prescribed it for lung conditions, neurological conditions, rheumatism, and conditions pertaining to women's reproductive organs such as infertility, menstrual problems, inflammation of the uterus or ovaries, potential miscarriage, and relief of labor pains. Black Cohosh can also help prevent osteoporosis. 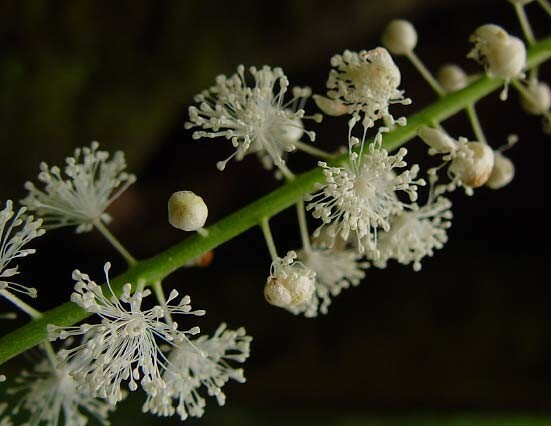 Breast-feeding or pregnant women should not take black cohosh. It is very commonly known as black snakeroot. The other names that people know this herb as, are bugbane, squawroot.